­Look again, however, because Americans do have a choice. 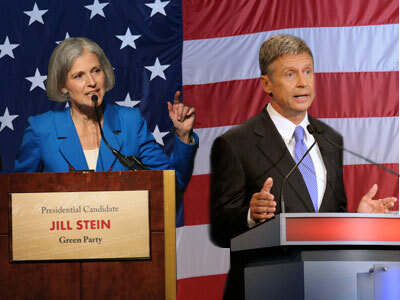 For instance, consider what presidential candidates Gary Johnson (former Governor of New Mexico) of the Libertarian Party, and Jill Stein of the Green Party have to say. Watch Monday evening’s second and final Third Party Presidential Debate from Washington DC, hosted by RT, where both these candidates will offer American voters real options; or at least different options from what political look-alikes Mitt and Barack are offering; “Oromney” and “Rombama” as some have dubbed them. 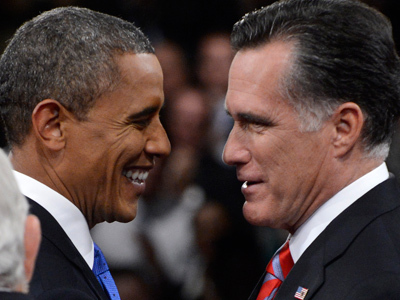 Many American voters were particularly taken aback by the latest major prime-time candidate “debate” focusing on foreign policy, in which Obama and Romney seemed to agree on all those key issues that have got – and continue to get – America and the world into so much trouble. Both expressed unflinching support for Israel, even though it’s the sole saber-rattling nuclear power in the Middle East; both continue to threaten Iran with unilateral military attack, demonizing that country as a “threat to the international community,” even though Iran hasn’t attacked any neighbor in over a century (actually, Iran was repeatedly attacked directly by the Western powers or through proxies like Saddam Hussein); both pledged continued support for terrorist “freedom fighters” in Syria’s civil war triggered by the US and allies, just as they did in Iraq and Libya; and both will continue hi-tech drone attacks over Pakistan and Afghanistan, which seem particularly fond of local wedding parties. But are there no foreign policy options? How about pulling out of the Middle East and stop triggering generalized civil war in the region – aka, “Arab Spring”? Why not curb America’s pro-Israel foreign policy lobbies and put the US national interest back in center stage instead of Israel’s national interest as happens today? On the global financial scene, why not stop bailing out the irresponsible and criminal Bankster claque to the tune of trillions upon trillions of dollars – with the Fed’s recently-announced QEIII acting as yet another open-ended Bankster Charity Fund – and start bailing out American workers for a change? Here Republicans and Democrats are in full pro-bankster sync. It doesn’t always have to be this way. Although it doesn’t hit mainstream media headlines, American Voters do have other choices. 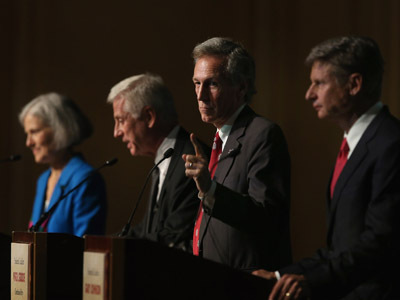 A week ago, the Free & Equal Elections Foundation sponsored a Third Party Candidates Debate that included Gary Jackson and Jill Stein, together with Rocky Anderson of the Justice Party and Virgil Goode of the Constitution Party. It was aired nationwide and worldwide by RT, moderated by Larry King, and boycotted by the mainstream media. Obama and Romney also boycotted this debate by declining invitations to attend, a clear snub at the American voter. 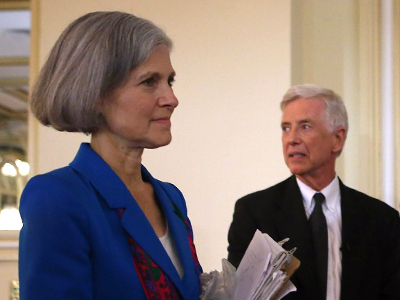 Reflecting the public’s favorites from that first debate, tomorrow Johnson and Stein will meet once again to speak to America on key issues. Gary Johnson, a former Republican, says lots of things millions of Americans want to hear: cut military spending by 43 per cent; stop meddling in Syria and Libya; stop threatening Iran with military attack; refuse to support Israel if it decides to go against Iran on its own; stop fueling America’s imperial overdrive and over-reach. Johnson also supports Ron Paul’s crusade to audit the Federal Reserve Bank and even to close it down altogether, recognizing that the Fed is the culprit for the ongoing financial crisis, having allowed the Bankster takeover of the US and global financial systems. A courageous and powerful statement from a female candidate who personally took part in the Occupy Wall Street movement and was arrested several times for peacefully and democratically daring to express her ideas in a country that is fast becoming a police state under Gestapo-like FEMA/FBI/CIA/NSA/local police thugs. A key factor to the Global Power Elite’s stranglehold on We the People is what America and its favorite allies call the “two-party system”, glorifying it as the “backbone of democracy”. If we take a closer look, however, we find that “two-party-system-democracy” – whether of Democrats and Republicans as in America, Labour and Conservatives in the UK, Christian Democrats and Social Democrats in Germany, and similar variants in most other countries – hides a neat and simplistic mechanism of coaxing people into the lowest infantile common denominators for “solutions to our nation’s problems”. What the two-party-system basically does is impose one sole mainstream ideological road that’s been previously surveyed and approved as “politically correct” for Global Power Master interests and objectives. Then, they put a face to each party: your Obamas, Romneys, Bushes, McCains, Clintons… Then, they let voters play around making believe they have an absolutely free and democratic choice to decide whether they will drive on the left side or right side of that one sole road. But don’t they dare look around for other, more direct highways or “kinder, gentler” side-roads that might carry them and their nation towards a very different, far more beneficial destination! No, no. 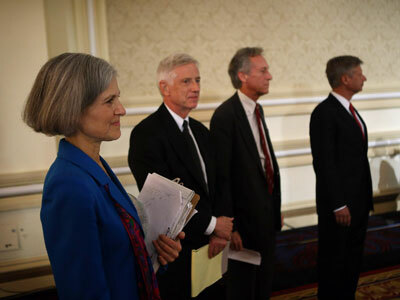 In America, voters must choose between Bush and Gore, or Bush and Kerry, or Obama and McCain, or Obama and Romney. It must boil down to the “have-a-pepsi-or-coke…” option: you might think you’ve been given a choice, but more and more people are realizing that both are basically the same brown, sugary, bubbly slushy soda drink. It doesn’t always have to be that way. In an incredible twist of history, US “democracy” has sunk to such loathsome depths that in order for American voters to even learn about electoral options for their country, they must now tune-in to RT of the Russian Federation. How times have changed from when the Global Power Masters played with our fears about the “red menace”, “mutually assured destruction” and “better dead than red”! But why should people outside the US really care whether Americans will pay more or less in taxes, have better or worse healthcare, or whether unemployment, inflation and poverty will rise or fall? Here’s why: in today’s highly complex global power structure, where an unelected but extremely powerful private Global Power Elite have become embedded into the US and its key allies, whatever happens there will affect all of us. But when US voters put the wrong guy in the White House, that means untold millions of dead, injured, maimed and wrecked lives in Iraq, Libya, Syria, Egypt, Palestine, Latin America, Africa, Asia and other places in this dark, troubled world. So, yes, it is our business to make sure slumbering American Voters wake up. Not just for their sakes, but for the rest of the world’s sake. A new generation of war-mongers is right now preparing to double their bets on the geopolitical arena. They have no qualms in risking outright military confrontation, not just with Iran, but even with Russia and China. Maybe that reflects their mad geopolitical ambitions; maybe it’s about their less mad realization that they have so completely destroyed the global financial system that their only way out is to “flee forwards” to an overwhelming world war, the likes of which mankind can hardly fathom. The Global Power Masters already pulled something like that back in 1914 and especially in 1939; why shouldn’t they be tempted to so again? Not that they’re a panacea for America. Not that American voters should childishly “fall in love and rave” about them. 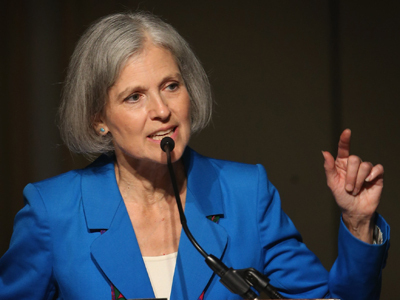 Actually, it’s not so much that Jackson or Stein are better, but rather that Obama and Romney are so much worse! A final irony: in a world where politicians and media moguls speak and drool over “democracy”, on November 6 around 60, maybe 70, million US voters will decide the destiny over the next four years for 7 billion people. That’s 1 per cent deciding for the remaining 99 per cent. Democracy should be made of sterner stuff! Let’s hope US voters realize the huge global responsibility they carry upon their shoulders. In the end, the world will hold them accountable.